I am seasonal limbo right now... ready to dive head first into fall, but not yet quite ready to fully give up summer. Anyone else with me on this? So, yeah... I posted a recipe makeover of my Homemade Crock Pot Apple Butter yesterday and today I am sharing a fruity, frozen drink with you all. 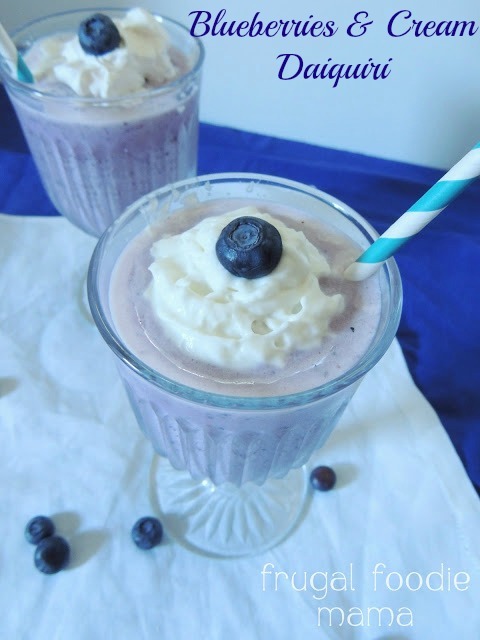 My Blueberries & Cream Daiquiris are another drink creation that came from my Summer Simple Syrups 3 Ways. This drink recipe uses the blueberry simple syrup. If you don't want to make a batch of the blueberry simple syrup, you could just up the amount of blueberries in this drink and use plain simple syrup instead. Place all of the ingredients in a blender and blend until smooth. Pour evenly into two glasses. Top with whipped cream and fresh blueberries, if you prefer. So here to my last fruity, creamy toast to summer!